The God of Wealth has once again called upon the Sickles to (hopefully this time also actually succeed) act as a tool of war. Not far away from the recent battle rumors has it that there is some kind of relics from an unknown maker in the vicinity. The mission; to find and secure. The Sickles makes haste since they know that the (blasted) Varuna Legion also operates in the area, full of confidence (and without trauma points...), yet to broken. Captain Staya assort the strike team personally, if you want anything done - do it yourself. 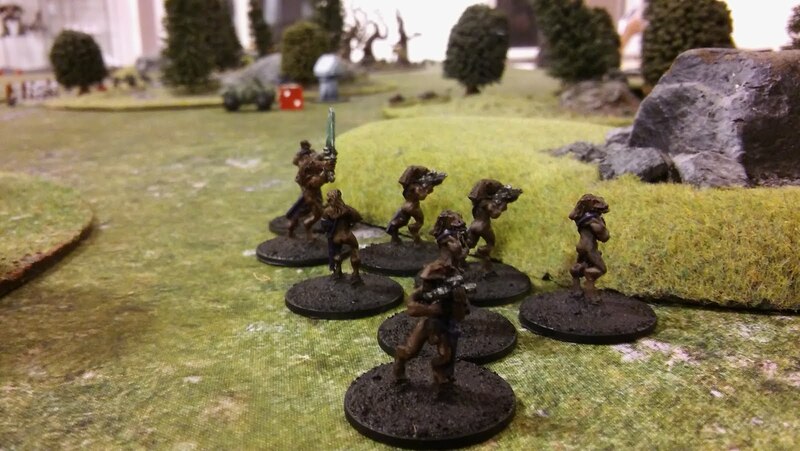 Some Lhurgg units are mustered alongside troopers from the Sickles, despite some of those units surely needs some R&R to lick their wounds. Himself (Field Command 3rd Grade, Tier II)! Bullet Bullies (Rookie Rifle Team, Tier II), new unit! Velocity Vintovkas (Rookie Rifle Team, Tier II), was in the last battle and has 5 trauma. They sure need some rest! Beeping Brawlers (Drone Recruits, Tier I), chrome and shine! The force of the Varuna Legion. Fort Vega Cadets (Recruits, Tier I), with Amazing Stamina (+1 Move). 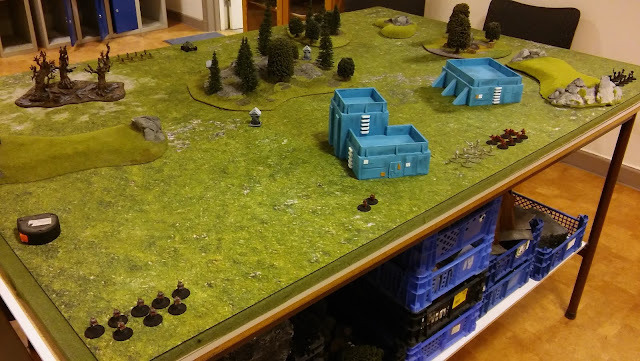 Table setup. 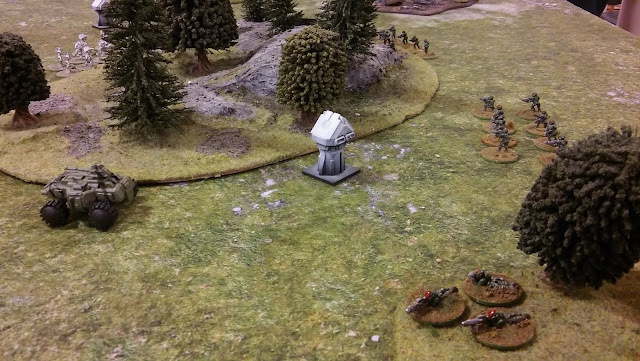 The three grey small... "monoliths" were the objectives. The Sickles deployed, from left to right. Beeping Brawlers, Ground Gagarin, Swift Swords, Kicking Kepis and Tribal Tribute, a total of 6 composition points. The scenario indicates that we would fight over the control over three objectives. During this game, a unit may use a special action (forfeiting any other action) to check the objective, as "there can be only one! ", as Highlander taught us. Anyway, first check is on 5+ for being the objective that we are looking for, rendering a +1 modifier on any checks on the remaining two. 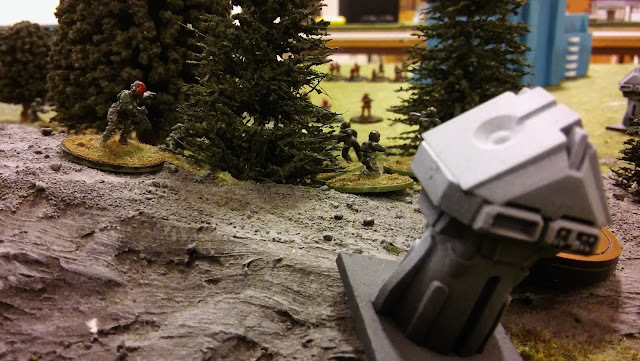 The force holding the objective can't be routed and win at game end (which could end from turn 12 and on). In the rules there are some, in our opinion, inconsequential rules regarding number of units, composition points (for fielding units) and unit tiers. We made a house rule to Always use any of these restrictions bound to compositions points (i.e. 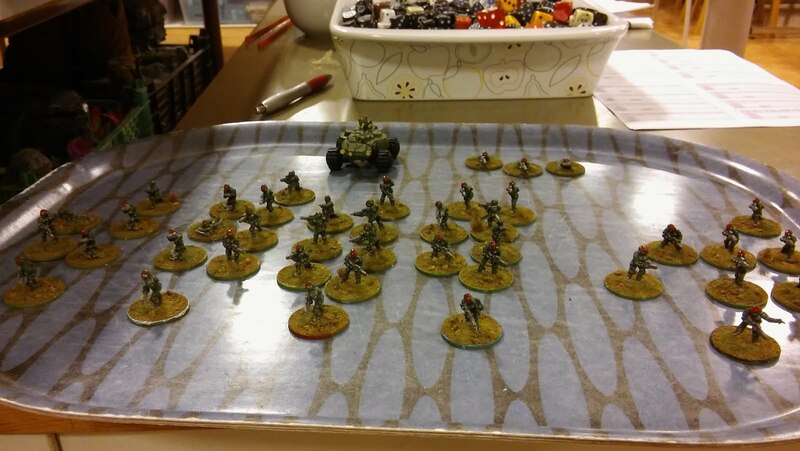 reinforcements, determine number of units to deploy, rout etc.). Easy, and in most cases the most fair way to do it, if you ask us at least. 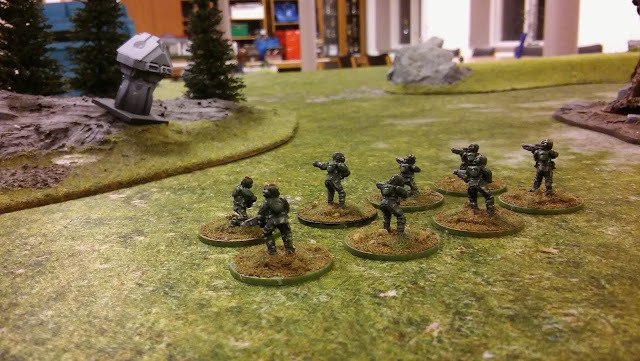 The Varuna Legion fielded their LMG section on the Sickles far right flank, the M5 patrol vehicle in the center (replacement for the loss of the one prior to this battle, a unit which had Incendiary rounds) and the Black Team on the Sickles far left flank. OAll in all, all units moved forward at high pace to get to the objectives. The M5 covered one objective, locking the Sickles right flank. The LMG section got into position to cover the M5 but still stayed in reach for the closest objective. Black Team secured the second objective on the Varuna Legions side of the table. 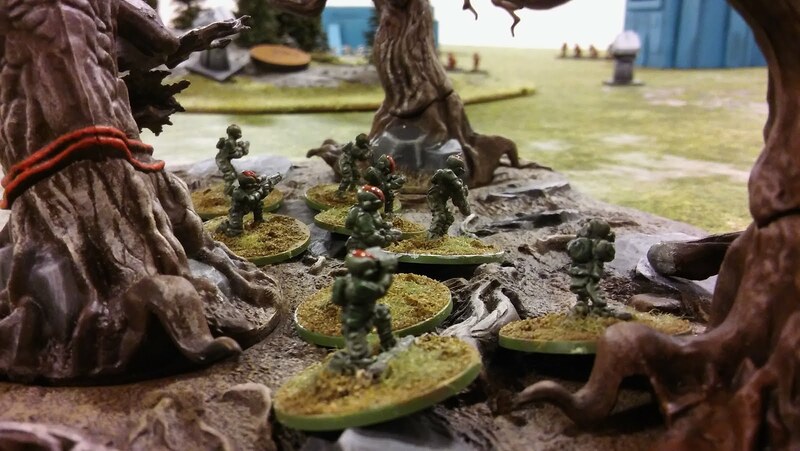 The Sickles moved all units forward, using the terrain as cover. Swift Swords moved towards the one, and only, objective on their side of the table. Ground Gagarin, found line of sight and started shelling Black Team, sadly to no effect. May the God of Dices not have abandoned me once again! "No problem Mr. M5, we cover your metal @!#"
"Show us your best shot Ground Gagarin!" First reinforcements arrived. Bulliet Bullies in the center for the Sickles (finally some quality troops eh?) 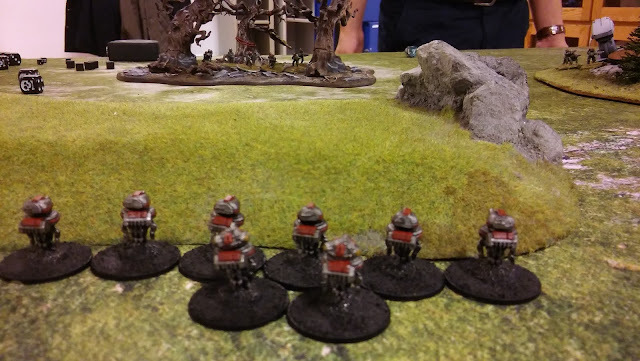 while the Varuna Legion deployed Fort Vega Cadets on the Sickles far left, facing Beeping Brawlers, but also the Red Skulls Assault Team in the center. Alas, the Varuna Legion got the initiative and checked the objective close to Black Team, and it was relic we were fighting for! The Varuna Legion got into defence, while the Sickles now had to mount an attack and claim what is, somewhat, (at least should be) rightfully theirs! 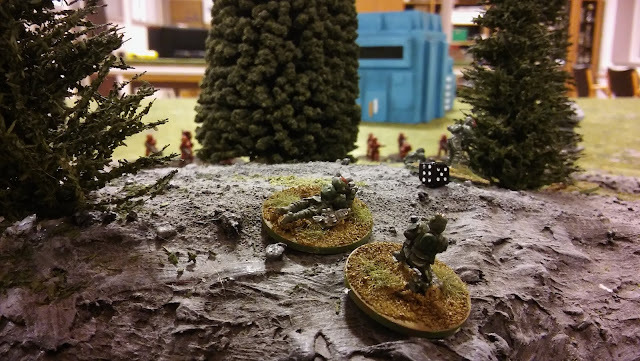 Ground Gagarin sets up in a building to cover the right flank, forcing the varunian LMG section to redeploy. To the right; Bullet Bullies! Another view of the battlefield. On the far side of the forest to the left, you can see the flanking Lhurrghs from Tribal Tribute. These actually are the droids we are looking for. Here waiting for the Fort Vega Cadets to make the first move, who are doing vice versa. Both units spent most of the time waiting for a good moment to push forward. Fire was exchanged on the right flank. Ground Gagarin was scratching the paintjob on the M5, which seemed to helped Kicking Kepis in the building to find their target. 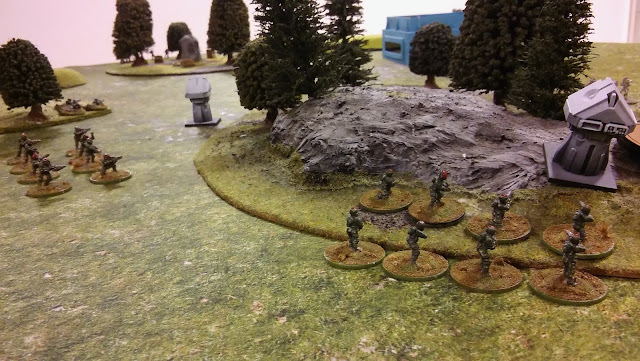 They scored a perfect hit, dealing 7 damage to the M5 which was put out of action (we had no wool for this game, yet again, so a radioactive die symbol got to make do for the knocked out vehicle. 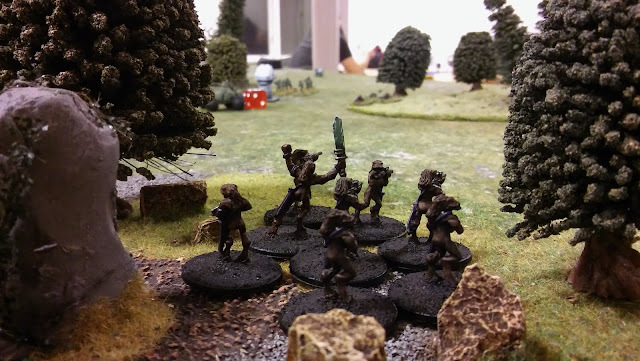 As an act of revenge the varunian LMG section returned fire and knocked Kicking Kepis to smithereens, falling back with no chance of regrouping (since I failed all the rolls to regroup, haha). A good trade for me (Tier I for a Tier II)! It also gained me an additional advantage since I now had far more units (almost the double) than my opponent Joel. Since he was on the defence, I could wait and see what he would do first, acting and thus reacting later with most units. It was now pretty obvious how the battlefield was molded. 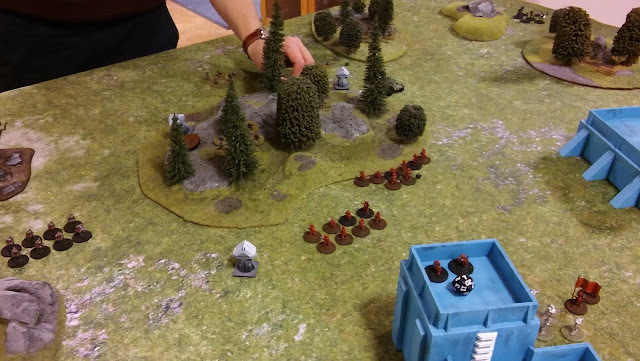 The left flank had some kind of Mexican standoff between the Fort Vega Cadets in the forest and the Beeping Brawlers behind the hill, a stalemate. 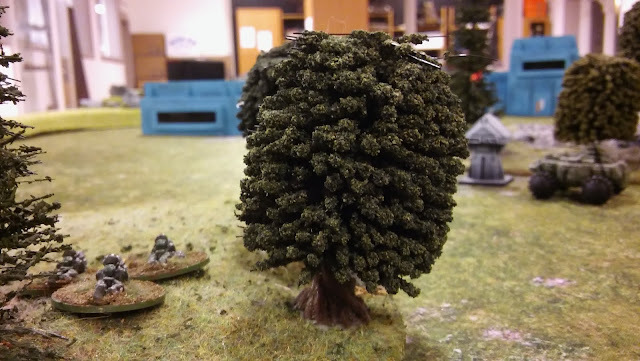 On the right losses were mounting as Kicking Kepis was retreating off the board and the M5 was just a pile of metal and burning smoke. The Lhurggh unit, Tribal Tribute moved from cover to cover and avoided fire for a long time, still locking the right flank. Joel sent in reinforcements, Blue Team to protect the LMG section. Outside the so important 2" from the edge, and therefore hidden from scary machine guns! Next cover! Getting ready to valiantly attack the LMG section. Their comrades, Hard Hoofs, did it some games ago with... a disappointing result. Good luck guys! Raff raff! Then something incredible happened! Joel saw a miss in my placement behind the hill and repositioned the LMG section to open fire, and got 7 hits! Ouch! Bye bye... and then... so many 1:s. Gosh! Jeez! Come again? Only 3? 3 suppression from 7 hits? Okey then. They didn't even got pinned (remember the 14th colonials? They also did this trick, apparently armour is not needed). What did I do? I hit back! 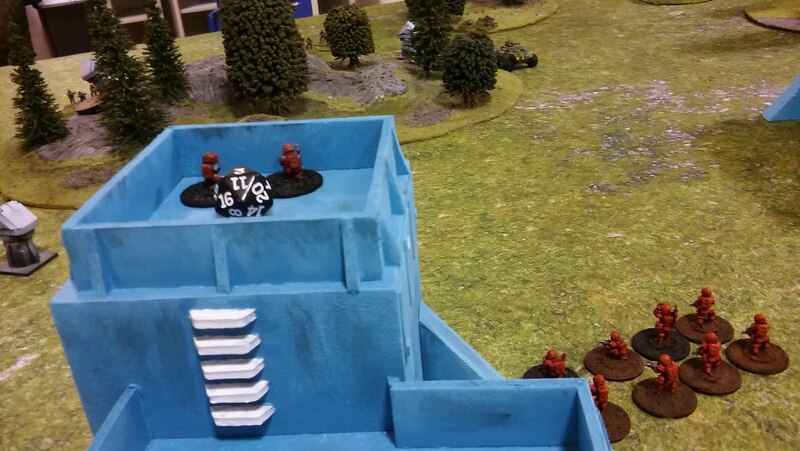 Up on the hills, guns blazing and seconds later (and some rolls) the LMG section lost a member and was broken! The Lhurggh (as a whole) first achievement! The erm... reinforcement, then beat back the Tribal Tribute killing three and giving them 12 suppression, but I was proud! Dang, I was proud! "You wanna live forever!? Let's kill some Lhurggs!" So what's happening on the left flank? Chillin' in the forest, Swedish style. The standoff continues. 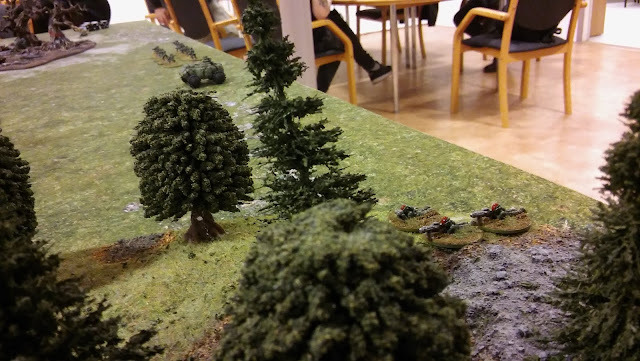 So a lot of action took place in the middle, near of the objective (as it should!). It was very exciting since the forest made all support useless but still cut off reinforcements to enter the area. So far a very good game indeed! 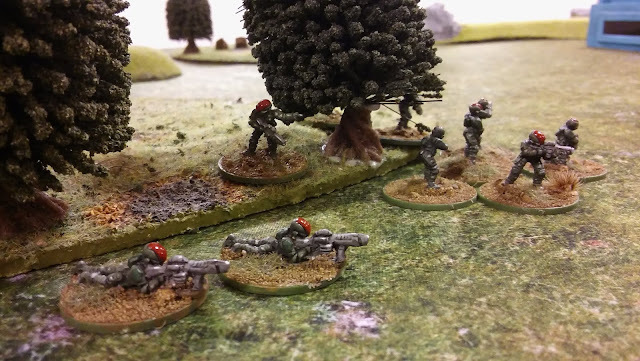 Since the Velocity Vintovkas and Captain Stoya was deployed in the middle and advancing towards the forest in the center, Joel deployed his last units in the middle. The Grenadiers Team. He also activated the Red Skulls Assault Team which allowed him to fire at point blank range! And roll 1. Giving 1 suppression. The battle for the middle forest had some trouble since every unit had +2 Defence and we rolled awfully bad, both of us. Sometimes tactics don't cut the deal! Now, time to seize the opportunity of attack! 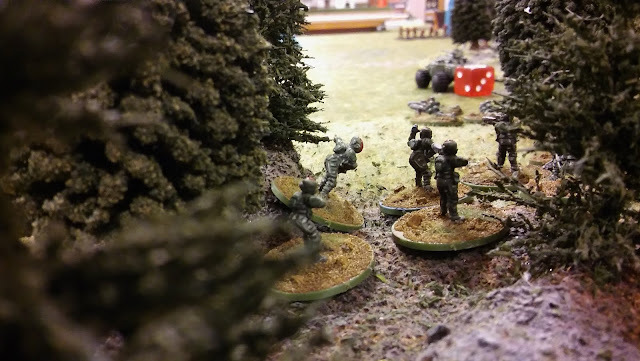 Joel repositioned the fast(er) Fort Vega Cadets to aid the center, but was caught in a hail of fire from Ground Gagarin indirect fire, thus using their speed to quickly leave the battlefield. Beep beep! Beeping Brawlers advanced to flank the varunian defenders of the objective. Overview of the battle. The Sickles "elite" troops advanced while Captain Staya shouted orders. Captain Staya (and Ground Gagarin, with their pistols!) fired upon the retreated Swift Swords to "convince" them to return back, to no effect. But they rallied anyway so they didn't seem to mind... maybe it's some kind of alien culture thing. 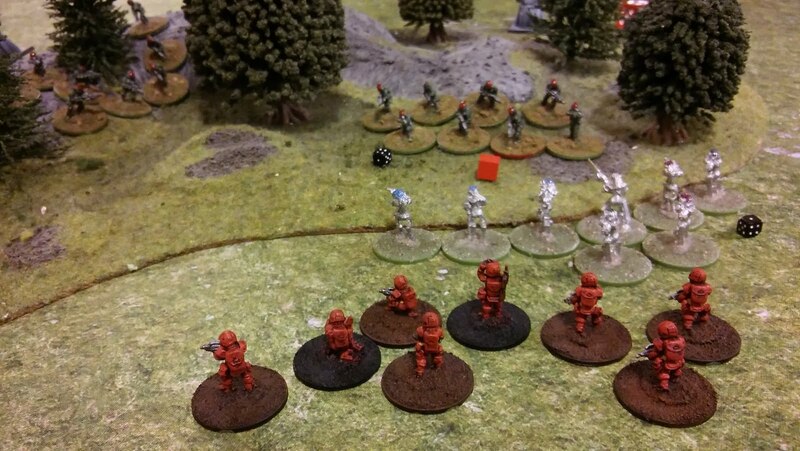 Captain Staya also orders his troops forward with the Command Ability, giving me the momentum. "Holy sh!t, it's a whole other company!" With the momentum, and more units and got the upper hand in the middle. Joel still had the Blue Team and the now rallied LMG section, but they were out of position to aid their allies. That's 4 of Joels 12 composition points, a great deal! I broke the Black Team and assaulted them, killing all! No quarters is given! Beeping Brawlers caught the Grenadiers Team in the open, breaking their morale. As the Varuna Legion wasn't holding the objective any more, they were routed. The Sickles won! Their first win in the campaign! "Fall back! The red tide is coming!" It felt very good to win! Firstly, I got some well needed funds and experience and not that much trauma. Now, some of Joels units needs respite and he also lost two Tier II units this game. This will also give me some breathing room. It also feels good to actually giving my opponent a rough time, it's not fun to always lose, or win!. Great game all in all! It seems that PMC2640 always gives great games, huh! 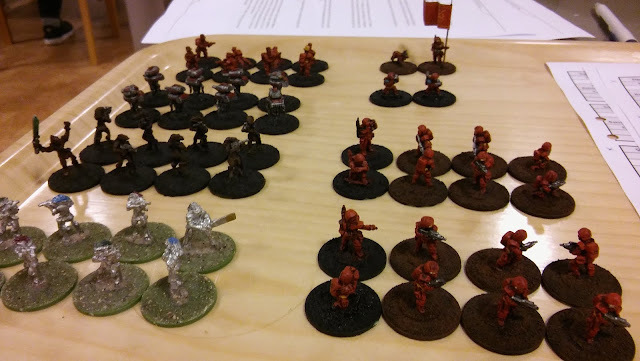 The surviving units of the Varuna Legion; the remnants of the LMG section and Blue Team. For the 10 kUC I bought some new units. A new Tier II patrol vehicle (my third), a Lhurggh Tier II nomad unit (from the expansion, they got stealth!) and a Tier I HQ. The Tier I HQ don't have the Inspiring Presence, increasing the odds to rally, but they cost half as much and still lets me activate the "Not a step backwards!" company ability. I need to try that out! No levels ups for my units yet, but at least no battle traumas! Joels Red Skulls Assault Team got "Into the shadows", giving them the stealth ability, a very scary combo indeed. Lurking for the right momentto strike! Temat Enkel. Temabilder från Matt Vince. Använder Blogger.